1. Look after your health: When you are in good health you are full of energy and you will attract positive thoughts. Exercise is the right thing to do especially when you feel bad about yourself. I do. When I am feeling out of place I go for a good jog. At the end of a jog, I sweat it out and I feel good inside out. Remember to get enough sleep as well. 2. When your negative thoughts flash through your mind: Quickly replace the negative ideas with positive ones. Do not allow the negative feelings to sink into your mind. It zaps your energy. 3. Happy company: Hang around with happy people. It’s contagious. Positive thinking people will influence your mindset and you will eventually behave just like them. 4. A list of the things that make you happy: Write down a list of those happy occasions. When your energy is low on any day take a look at the list to get rid of those sad feelings. 5. Live in the present: The past is dead and gone and the future is not here yet. Enjoy the daily life and find happiness in it. Look for the tiny little happiness every now and then. For all you know the big celebration may never come. No more wishful thinking like I’ll be happy when…..
6. Be happy with what you have: Don't try and keep up with the Joneses. Enjoy life with what you have while you pursue to get the things you want in life. Count your blessings instead of your troubles. 7. Something to look forward to: Indulge in activities that you enjoy doing on a regular basis. For instance I love blogging. I post an article every day. I look at my Traffic Rank every few days. I receive encouraging comments every now and then. These little things cheer me up. 8. Help Others: Even a small gesture of complementing another person will put a sparkle in the eyes and it lifts your mood as well. It vitalizes your positive energy when you know you are capable of helping others. 9. Be yourself: Accept yourself as what you are. You are one unique individual with your strengths and weaknesses. Be yourself and carry on living. 10. Don’t worry, be happy: There goes the title of the song. Most of the time the things that you worry about never happen. So why think about it. Instead use the time to do some creative thinking on how to be happier in life. I hope this article is able to cheer you up, lift your spirits and make you as happy as can be. 1. Maintaining a high standard of discipline and work: An effective executive is ambitious. He is able to set challenging goals and a high standard of performance so that the work is challenging and meaningful. Productivity is boosted by a team of satisfied and committed subordinates. 2. Prioritizes his work: An effective executive is result-oriented. He focuses on the important issues to achieve the best results and ignores minor tasks. He is creative and resourceful to bring about changes – more efficient work procedures, better productivity and higher yields. 3. Motivates the employees: He treats all employees with respect. He delegates challenging tasks so that the employees will become more motivated, more committed to the organization, more productive and more satisfied with their job. He shows appreciation whenever a job is done. 4. Treats all the staff fairly and equally: He is impartial and honest. He rewards his staff based on work performance. He creates high staff morale and fosters teamwork among them. 5. Open-minded: He is receptive to employees’ ideas and suggestions. When you listen and adopt suggestions given by the staff, they are more committed to the company and further improvement will take place as better ideas will be created by the staff. 6. Praises in public and criticizes in private: He knows human psychology very well. Staff morale is lifted by public recognition. The staff is further motivated to be more committed to the company. A smart executive will always take advantage of education opportunities to up-date himself on knowledge relating to his area of expertise and other managerial skills. At the same time he shares his knowledge with his subordinates and helps them in their personal development and career goals. Without challenging goals and a high standard of performance: Without challenging goals and a high performance standard, the staff will underperform and do shoddy work. Productivity nosedives. Staff do not find interest at work and they enjoy very little satisfaction in their job. Ignoring feedback: He fails to accept constructive criticism and workable suggestions by the subordinates. He assumes he is right and he knows everything. Criticizing staff in public: By belittling employee in public, an executive kills their enthusiasm and demoralizes them. Does not value the staff: He shows no appreciation of the staff. He takes good staff for granted without a pat on their shoulders when a job is done. He shows no respect to staff and take advantage of them for personal gain. Does not prioritize the work: He fails to do the right things at the right time. Valuable time is wasted and productivity is curtailed in putting out fire. As an example, a manager fails to initiate regular preventive maintenance and incurs losses of valuable time to cope with expensive repair. Intimidation: Instead of motivating the staff, an executive creates fear among the staff, For example, he uses the annual staff appraisal to threaten them instead of doing a proper review to highlight their strengths and weaknesses and reward their performance accordingly. Playing favoritism: Not only he creates jealousy and resentment among the staff, there is no teamwork at all. Productivity suffers in the end. 1. Casual Conversation: A new idea emerges when you talk to colleagues during a coffee break or it happens when you talk to your family members, Ideas develop when you indulge in free association of thoughts, wishful thinking and daydreaming. 2. Sharing Information: A free flow of information between people and departments is an essential means of capturing, reinforcing and disseminating ideas by the imaginative use of information. 3. A broader perspective: Go beyond your own area of work. Expose yourself to non-related issues such as politics, fashion and religion. 4. Intuitive action: According to research by the International Institute of Management Development (IMD) in Lausanne, Switzerland intuition plays a vital role in how people reach effective decisions. Allow your “gut feeling” to work wonder. 5. Avoid pressure: Working long hours and under pressure inhibits creativity. There is no chance for you to learn and enrich your life outside of your work. 6. Sleep Over it: One effective way of getting new ides is to sleep over it. You think very hard about a problem at hand and then you go to sleep and forget about it. Before you know when you wake up in the morning a new idea is already in your mind. 7. A conducive environment: Nurture the free flow of your creative juice in a situation that works best for you. For me a quiet room without the distractions of outside noise at a tidy desk suits me. Avoid interruptions. According to Thomas Edison genius is 1 percent inspiration and 99 percent perspiration. Orkut was voted one of the best social networking sites by PC.com (a magazine published in Malaysia) with a score of 8/10 in their April 08 issue. Joining Orkut is easy. You can sign up and login using your Gmail e-mail address the same way as you access your Blogger account. One of its features is that you can post short comments along with photos and videos in your Scrapbook. The other cool thing is that your can add your favorite applications such as Chat Rooms, IQ Test and carrom. It has over 600 applications from their Application Directory. I have just added Mr. Bean to my home page (watch video on YouTube). However, it is reported that 60% of the users are between the age group of 18 to 25 and 60% of them are looking for friendship. It is also highlighted that Orkut is very popular in Brazil, India and United States. It looks like there are not many senior citizens using this platform. Anyway I have joined and I will look for people sharing the same interest like mine. How often do you bookmark your articles at twitter? You don’t have to do it every time when you have new articles posted at your site. You can go to twitterfeed.com to submit your feed to twitter. First of all you login to twitterfeed using your OpenID and provide your blog's RSS feed (e.g. http://yourblogname.blogspot/feeds/posts/full) and also tell them how often you want them to post to twitter. When you have a Google account you can use your Blogger URL as your OpenID, e.g. http:// yourblogname.blogspot.com. According to Wikipedia, OpenID is an open, decentralized single sign-on standard, allowing users to log onto many services with the same digital identity. An OpenID is in the form of a URL, and is unique in that the user is authenticated by their OpenID provider (that is, the entity hosting their OpenID URL). TRCB.com is an article directory. It is established in July 4, 2008. Over a short period of less than six months it has already recorded an impressive Traffic Rank of 238503 (as at December 19, 2008) and a PageRank of 2/10 (as at December 19, 2008).The successful and seamless execution of this blog is the teamwork of Siddique, Tcat and Gudrun. They are able to work together while living far apart is really remarkable. When you join as a member you are given more than a red carpet welcome. Your articles are exposed to wide audiences because according to Alexa this blog is very popular in United States, India, United Kingdom, Sweden and Australia. TRCB is able to give you detailed statistics of your published articles such as total article published and total article views. It also provides you with a list of your popular articles published and a listing of your articles in the popular articles of a particular topic. In short, your articles receive extensive publicity. However, that is only part of the story. The other good thing is that you can collect earnings from AdSense when your articles are approved and published. Just check any one of the articles featured at TRCB you will notice that it is surrounded by ads from AdSense. You have to supply your AdSense codes to them and the earnings go straight to your AdSense account. Effectively, you are collecting earnings from two websites, your own as well as from TRCB.com. I have well over 100 articles published by TRCB.com and close to 3000 views. Why don't you make it a New Year’s resolution for 2009 to submit your compelling articles to TRCB <http://www.trcb.com > for fame and fortune? "Fastest rising" means Google looked at the most popular searches conducted for 11 months of 2008 (they compile this list by early December) and then ranked them based on how much their popularity increased compared to 2007. "Most popular" searches are ranked in order of the queries with the largest volume of searches for 2008. According to Wikipedia Zeitgeist is a German word. It means the spirit of the age and its society. 1. Content, goals, and your audience: Decide on a subject that is in line with the theme of your blog. The purpose of writing the article will also affect your style of presentation. Bear in mind the audience that you are addressing to and decide on the tone of the article. 2. Relevancy, style and organization: Is your content able to deliver in accordance with the article title? Do not over promise and under deliver. Write in the appropriate style to deliver the article to your readers. Organize your article seamlessly from one topic to another and from one paragraph to another. Do not write in large blocks of text. Use bullet points more often. Highlight the main words. 3. Spelling, choice of words and grammar: As English is not my first language and unlike Chinese, I have to pay attention to tenses, singular, plural and agreement. Spelling is another thorny issue. Spelling checkers cannot really discover all the mistakes. You just need to go through the whole text slowly yourself. The choice of words is also important. The right words will create an impact on your readers. The wrong choice of words will discount the value of your article. When you have done with the article, let it simmer for a while. When you come back later to take a look at it again you never know, perhaps, you can improve the quality further. 4. Someone to edit the article: When you have completed your article ask someone else to edit it for you. Two heads are better than one and errors that you have overlooked can be discovered by another person. 5. Final proofreading: Before going live read the whole article again, because glaring mistakes could have escaped you and the person who edited the article. Check the spelling one more time before posting it. It was front page news in the local Chinese newspaper about a man by the name of Lim Seong Choon, 61, from Kuantan, Malaysia, a town where I am from. He finally got his citizenship statues after 40 years. He made his first application for citizenship when he was 21. He was successful on his sixth attempt and after four oral tests. 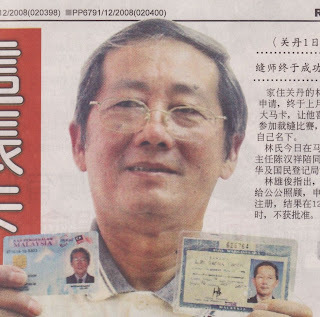 He was born and raised in Kuala Lumpur but he could not get his citizenship confirmed because his name was different from the one in his birth certificate. He was considered a permanent resident since his temporary identification document bore a different name. He stopped schooling and took up a course in tailoring. With his tailoring skills he was able to secure a job at a leading tailor in Kuala Lumpur. He was only paid half the rate because of his status and he dared not complain. He married twice and has four children. He moved to Kuantan in the 1980s and worked behind the scenes for several leading tailors here. Because of his expertise and active involvement, he was nominated to represent the Kuantan Tailors Association in international competitions for master tailors overseas, but he could not go due to his permanent resident status. Now, as a Malaysian he is over the moon because he can travel the world like any other citizens to participate in competitions. The sharp corner of a building or a billboard will affect your health negatively and you will succumb to illnesses easily. You should always cover your window with a curtain. 2. Avoid a protruding bean above your bed: With something hanging over your bed you will have more nightmares during your sleep. Your work pressure will increase. You are easily tired and your energy will sap. Your career and business will not prosper and your health and fortune will go from bad to worse. Change the location of your bed or renovate the ceiling so that it is flat. 3. Proper support for the bedhead: Make sure that your bed is against the wall. If it doesn’t you will lack support from important people. You will have a lot of problems at the workspace. Fill up the vacant space by building a cabinet behind it. 4. Your bed is facing the door or the toilet door: You will encounter relationship problems, legal issues, accidents and …Always keep the door closed or place a screen in between. 5. A mirror is facing your bed: It will adversely affect the relationship of the couple living in the room. The man will have affairs and the lady will find another man outside. Cover the mirror at night or relocate the mirror. 6. Lights above the bed: Avoid having lights right above your bed, it is bad for your health in the long run. Move the location of the lights. 7. Your bed is facing the main door: When you can see the main door from your bed you will not be able to hold your wealth and you will easily attract illnesses. Hang blessed ancient Chinese coins above the bedroom door and the main door to neutralize the ill effect. 1. Color scheme: The color of the room should give you a calming effect. The color should create an ambience of softness and tenderness. Go for light colors. 2. Avoid turning your bedroom into a storage area: Remove all unnecessary items from your bedroom. When your room is tidy and clean it will attract positive energy. Don’t place an aquarium and water-based plants inside the room. 3. Lighting: Your room should not be too bright or too dim. Suitable lighting will boost your energy and you will not get sick easily. 4. A perfect shape: Your room should be a perfect square or rectangle. When the room is in odd shape your fortune will suffer and misfortune will befall. Apply partition or install wall cabinets to the corners so that the room is in perfect shape. 5. Foul odor: When your room is facing the toilet or the kitchen, the air is filled with dampness and there is awful smell lingering. It affects your health and wellbeing, Install an exhaust fan or improve the ventilation in your room. 6. Direct sunlight: Glaring sunlight penetrates into your room and bed will cause dizziness and make you restless. Always use the curtain to shade your room and bed from the sun’s rays. 7. Insufficient natural light: Your room is in between two tall buildings and you don’t get enough sunlight. The situation depresses you and you are always feeling down. To overcome the situation put on extra lights in the room. According to the latest news from opera.com they have released their latest browser, Opera 10 alpha, showcasing their new Opera Presto 2.2 rendering engine. It reports that it is 30% faster on the real web. Opera 10 alpha also underlines any misspelled words while you are writing on Facebook wall, blogs or web mail. The beta version will be released in 2009 and the final release will be in the later part of 2009. 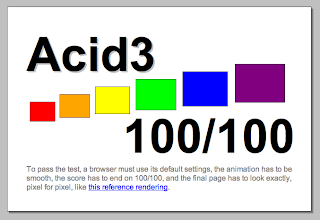 It is the only browser in the market with an Acid3 100/1000 score. XML stands for eXtensible Markup Language. It was designed to carry data, not to display data. XML is not a replacement for HTML. XML does not do anything. It was created to structure, store and transport information. XML tags are not predefined. It allows the author to define his own tags and his own document structure. HTML stands for Hyper Text Markup Language. Like XML, it is a markup language. A markup language is a set of makeup tags. The markup tags describe how text should be displayed. An HTML file is a text file with HTML tags. When a browser displays a web page, it will not show the markup tags. HTML has over 100 pre-defined tags. You can see a typical HTML page at a site by right clicking you mouse and go to View Source. You have heard of Alexa Rank and Google’s PageRank. How about your ranking based just on RSS feeds? ://URLFAN is the website doing just that. According to them their system parses millions of blog posts that are generated every day. They filter out spam, broken links and other various materials to determine how many times your website were mentioned on a daily basis. They refer this against every other website and determine where you rank among them. Currently they are ranking the popularity of more than three million websites by parsing more than 124 million blog posts from more than 2 million blog feeds. When you are at their website you can read about their All-Time Top 100 Ranked websites. It is a listing of the most-mentioned websites by bloggers. You can also check out the top active words of the day at Real-Time Buzz Rader. You can also go to Zeitgeist: The top buzz-worthy posts of the year to read the articles. If you have not submitted your feed, do it now because according to ://URLFAN your blog posts will be exposed to a lot of unique visitors every day. When you add a Bumper Icon to you site ://URLFAN will promote your most active posts to a wide audience at Buzz Rader. They can also provide your website profile in real time. According to research cancer thrives in an acidic environment and not in a normal, more alkaline environment. When you have cancer, your pH levels are low and your body is too acidic. The pH range is from 0 to 14, with 7 being neutral. Anything below 7 is acidic (low on oxygen) and anything above 7 is alkaline. The blood, lymph and cerebral spinal fluid in the human body are designed to be slightly alkaline at a pH of 7.4. Cancer cells become dormant at a pH slightly above 7.4 and will die at pH8.5 while healthy cells will live. Acidic foods cause sickness, diseases and aging. Alkaline foods keep your body healthy and functioning correctly, preventing cancer. 1. Be organized: Organize your files, schedules, desk and notes in an orderly way so that you don’t waste time looking for things. When you spend some time to set up your repetitive procedures and routine work you eventually save a lot of time on a daily basis. 2. Planning ahead: With proper planning you stimulate your brain with better and more efficient way of doing things. Planning also helps to identify possible conflicts and crisis and reduces the chances of emergency tasks. 3. Set priorities: Remember the rule of 80:20. 80 % of your results comes from 20% of your effort. Do the most important things first. 4. A to-do list: Organize your daily to-do list according to your priorities. A to-do list helps you to focus on the right things to do. The other plus point is that when you check off these things that you have completed it gives you a sense of accomplishment. Preferably prepare a to-do list in the evening for the following day. When you go to bed you know you have already organized your work well for the following day. 5. Delegation: Delegate more routine job so that you have more time to do what is important for your long term success. The time saved also allows you to handle interruptions such as emergencies. 6. Eliminate procrastination: There is a tendency to clear small tasks before doing the big things. Do the opposite by forcing yourself to take on the major issues first, this will help eliminate procrastination. * Conducting unnecessary meetings, visits or phone calls. * Start a job without proper planning. * Handling paperwork more than once. The moment you pick up a document decide what you want to do with it and do it once and for all and move on to the next. When you have managed your time well you work under less pressure and you will be happier at work. What are the uses of a Sitemap? There is a type of sitemap in HTML form which lists the pages of your site and is meant to help users find the information they need. Here we are talking about XML Sitemaps (with a capital S). Sitemap is a way of providing Google information about your site. By submitting a Sitemap Google will know about all the pages on your site including URLs that may not be discoverable by Google's normal crawling process. Add your site to Google Webmaster Tools account. On the Dashboard click Verify next to the site you want. In the Chose verification method list, select add a Meta tag. Copy the meta tag that appears on the page. In Google Sites, open the site you want to verify. In the top right comer, click Site Settings. In the Google Webmaster Tools verification box, paste the meta tag you copied from Webmaster Tools and click Save changes. Type the URL to your sitemap location in the provided field. When your Sitemap changes, you can resubmit it to Google to let them know. You can resubmit your sitemap by using Webmaster Tools. to see a list of the errors. A better answer would be: I think I can contribute more than my present job. Or I can take on more responsibilities. Don't ever mention that you have a poor relationship with your boss or you want more money. You strong points should be relating to the job that you are applying for. For example, you are applying for the position of Accounts Executive. Your expertise will be that you are able to analyze figures, see trends and forecast fairly accurately about the future. A good answer is that your strength is perceived to be seen as a weakness. For example, you give your staff tight deadlines and you also demand 100% accuracy in their work. Another point you can mention is that you are able to evaluate yourself and improve upon your weaknesses. 4. Which is the best Manager that you have ever worked with? A good answer is that my manager sets broad goals for me and I take the imitative to discharge my duties and responsibilities. A bad answer would be that the boss is always not around to bother me. 5. How about the worst manager? I don’t like a manager who is supervising me too closely. I am self-motivated to do my work. A bad answer is that you have complained about being given too much work to do. 6. What are the problems you face in your current job and how are you solving them? You should mention that you are able to identify problems and come up with workable solutions. Do not tell the interviewer that there is no problem at the workplace. 7. What are your most significant accomplishments? Mention about your achievements relating to the job that you are applying for. The most important thing is that you are able to reduce expenses, increase revenue, or improve the image of the company. 8. What can you do for us? Here you have to impress the interviewer that you have researched the company well and tell him how you can fit yourself into the organization. You should do research about the market rate of the post that you are applying for. The other thing that you can do is to ask for an offer and see if you can accept it. If the company is able to give you a position that fits into your career goals, it’s OK to accept a slightly lower pay. 10. What do you know about the company? When you have done your homework well you will have no problem to talk about the company. You can talk about its past, present and also its future plans and their mission statement. Mention their products and services. Highlight the outstanding achievements of the company. 1. Find out more about the company: The more you know the better it is for you as it tells the interviewer that you are interested and enthusiastic about the company. 2. Identify the location : find out the place of interview so that you don’t waste valuable time looking for it on the actual day. 1. Why are you looking for a job? 6. What are the problems you face in your current job and how are you solving them. 4. Prepare a list of questions to ask: You can enquire about training and development opportunities, workplace culture and major challenges of the job. 5. Practice: Rehearse with friend especially when the interview involves you for a presentation. 6. Documents: Check and make sure that all necessary certificates are in one file. 7. Dress appropriately: When you dress smartly and correctly for the occasion you create a good visual impact. 8. Arrive in sufficient time: Be there 15 to 30 minutes earlier so that you can relax and compose yourself. 9. Behavior: Smile and make eye contact with the interviewer. Sit upright and do not cross and uncross you legs. 10. Answering questions: Listen carefully and answer fully and directly. Do it in a friendly and positive tone and provide examples. Always tell the truth. 11. Ask the right question: Remember you have prepared some questions to ask, now is the time to do it. 12. Send a thank-you letter: In the letter you should repeat your interest in the position you have applied for. It is good to know straight from the horse’s mouth about SEO especially it is from the No 1 search engine, Google, itself. Recently Google has come out with a starter guide for SEO. I take the opportunity to make a hard copy for myself so that I can refer to it from time to time. It is stated in the guide that creating compelling and useful content will likely influence your website more than any of the other factors discussed here. Users know good content when they see it and will likely want to direct other users to it. This could be through blog posts, social media services, email, forums or other means. Organic or word-of-mouth buzz is what helps build your site's reputation with both users and Google, and it rarely comes without quality content. The big challenge here is to come up with quality content on a regular and consistent basis to attract users. • A Source of energy: The natural sugars are a great source of energy. They are ideal for either athletes or body builders who need a lot of energy naturally. • Weight gain: Raisins are good food for those who want to put on weight without accumulating cholesterol. • Heart-healthy food: Raisins are high in potassium and low in sodium. It is an ideal food to maintain normal blood pressure. • Fiber and tartaric acid: The fiber in raisins together with tartaric acid helps to regulates intestinal functions and promotes elimination and keeps the colon healthy. • Antioxidants: The phenolic compounds in raisins are powerful protective antioxidants. Eating raisins boost protection against heart disease and cancer. • Acidosis: Acidosis is a state of increased acidity of the blood (which is bad for health). Raisins are good source of potassium and magnesium which are very effective in reducing acidity. • Anemia: Raisins are a good source of iron which enriches blood and helps treat anemia. • Sexual vigor: Due to the presence of an amino acid called arginine raisins are known to stimulate libido, induce arousal and treat problems in erection. • Bones: While calcium is present in raisins, it is one of the best sources of baron, a micro nutrient which is helpful in preventing osteoporosis and is very beneficial for bones and joints. • Ocular health: The presence of polyphenolic phytonutrients in raisins helps protect eyes from damages caused by free radicals. It is also a good source of vitamin A which is essential for ocular health. • Oral health: Oleanolic acid, one of the antimicrobial phytochemicals which presents in raisins helps to protect teeth against tooth decay, cavities and in additional the presence of calcium also promotes dental health. Further more boron helps in checking the growth of germ in the mouth as well as maintains the health of bone and teeth. When you go shopping for grocery remember to buy a packet of raisins to boost the health of the whole family. 1. Update yourself: Constantly expose yourself to new ideas. Take the opportunity to accept managerial training when it is offered to you. Keep yourself up-to-date is the very basis and foundation of personal and career growth. The other thing that you can do is to read other magazines that you don’t normally read. Go out and meet more people, go to unfamiliar places and do things differently. 2. Do more than your scope of work: Go beyond your area of expertise. Ask for more responsibility. Make your career more interesting and more challenging. The more you do, the more capable you are to manage complicated and intricate issues. 3. Delegation: When you allow your employees to take over the details, you gain their respect because you have indicated to them that you have faith in their ability to do the job. Another thing is that it frees yourself to do the more important work you need to do. As an example, planning and implementing your plan are some of the important aspects of your job as a leader and executive. 4. Set a high standard of performance: Do not be complacent. Do not think that your current performance is the best. Do some brainstorming and try out new ideas. 5. Chart you own career path: Put your long term goals in writing. Assess your own strength and weaknesses. Capitalize on your strong points and move ahead. Be in control of your career path. Don’t let the personnel department to decide your future. Promote yourself and move up the corporate ladder. 6. Be resilient: In the unfortunate eventuality of a retrenchment, fortify yourself with bounce-back ability. How you respond to what happens to you is more important then what happens to you. Don’t keep it to yourself, let it out. Talk to your good friend and purge yourself of the emotion you feel over the setback. Learn a lesson from it. Think about your past successes and nourish yourself. Plan ahead and take action, your career is a lifelong journey. 7. Look after your health: Your health is your greatest asset. Keep your body in shape and your mind sharp and you will be more than capable of going the extra mile to do what you need to do to reach your career goals. Congratulate yourself when others are retrenched and you are still able to keep your job and move ahead. According to a local newspaper it is reported that whether we have our priorities right.Children are paying too much attention to excel in their education at the expense of their health and safety. It’s quite normal nowadays that parents wish to enroll their children in the best primary school in town and hope that they can have a head start in their education. But now you even have to book in advance a place with your tutor for your tuition for next year. Seeking educational excellence is going to the extreme. On the other hand the health of children in Malaysia is deteriorating at an alarming rate.Children as young as 7 are developing Type 2 diabetes.11 per cent of Peninsular Malaysia children between 6 and 12 were overweight and 6 percent were obese (2000UKM study). This has to do with their eating habit and couch-potato lifestyle. Parents are giving in to their children and pampering them by allowing them to frequent fast food outlets. The unhealthy eating habit contributes to the growing trend of Type 2 diabetes, high blood pressure and high cholesterol level. In addition, the safety of children is at stake. 8,000 children were missing in the last 5 years and three out of four missing children are girls, four of 10 children go missing after running away with peers or lovers. More than500 children were reported missing between January and May this year. In the meanwhile, Malaysian children are under tremendous stress. They have to do well academically and they have less time to spend outdoor to develop a healthy lifestyle. On top of that their safely is vulnerable. No wonder 130,000 children suffer from mental illnesses and 53 children under 11 and 1837 above 12 attempted suicides in 2000. One reason is that both the parents are working and they have no time for their children. They have not only neglected their children but their lives are equally stressful. Just spend some quality time on a regular basis with your children and it will make a world of difference. • Lack of appreciation for excellent performance: Top performers, like any other staff, need a pat on their shoulders from time to time to keep them motivated. • Insufficient meaningful and challenging work: The work may not be as varied and interesting as expected. Moreover there isn’t enough work and responsibility to keep them meaningfully occupied. • Little autonomy: Every now and then they have to refer to you to get a job done. It frustrates and demoralizes them to carry out their duties and responsibilities. • Limited career advancement: Positions at the top are limited or virtually nonexistent. • Poor communication: Top performers are result oriented. They want to know the visions and goals of the company. They may leave when the future outlook of the company is blur. 1. Create opportunities for them to excel and develop. 2. Appreciate and reward more of top performers. 3. Allow good people to make their own decisions and encourage them to take on more initiative. 4. Create rooms at the top for top performers. 5. Open up more communication channels. It is a good practice to do exit interview. When someone leaves the company there is always a reason. Find out why. There is a Chinese saying: When you start well, you are 50% successful. The same goes to the receiving of your new staff on the first day. Building a good relationship from the very beginning with new staff will ensure that they stay with the company for a long time. Make sure that their workplaces are organized, comfortable, secure and ready for their arrival. · Introduce the new staff to the company: Talk about its history, where it is now and where it is going and its mission and goals. · Company polices and procedures: Inform them about the rules and regulations that they must follow. · Introduction to departmental staff: Introduce to the co-workers of their department and other staff that they have on-the-job contact frequently. · Tour of the department: Show them around the workplace and the facilities. · Their Job: Talk to them about their duties and responsibilities and their day- to-day tasks and highlight the important aspect of their jobs. The most important thing is that you must be available on the first day. Your personal attention shows that you care about them. The other thing is to make sure that they are given enough work to do as they are full of energy and enthusiasm for their new job. Pay close attention to them for the first few days and congratulate the new employees when they have successfully completed a piece of work. First impressions are important. You are evaluating the new employees and the new employees are also evaluating the company. According to Wikipedia, phishing is the crime of attempting to acquire sensitive information such as usernames, passwords and credit card details by masquerading as a trusted entity in an online communication. Phishing is a nice word. It sounds like fishing. When you go fishing you put bait on a hook and you just wait patiently for a fish to bite the bait and you get the fish. Likewise someone may use a fraudulent site and hopefully an innocent victim will visit the site thinking that it is genuine and proceed as instructed to provide the phisher with vital and secretive information. If you think that is all, you are wrong. Your password is not permanent. It is time-sensitive. You are required to change the password from time to time. Keeping tract of the password is real pain for me. It makes attackers even more difficult to guess the password. Install a trustworthy anti-virus system and firewall on your computer and keep them up to date. Do not click on any link in an e-mail. If in doubt, contact your bank. Do not allow anyone to know your pins and passwords. Avoid using weak passwords like your name and your date of birth.